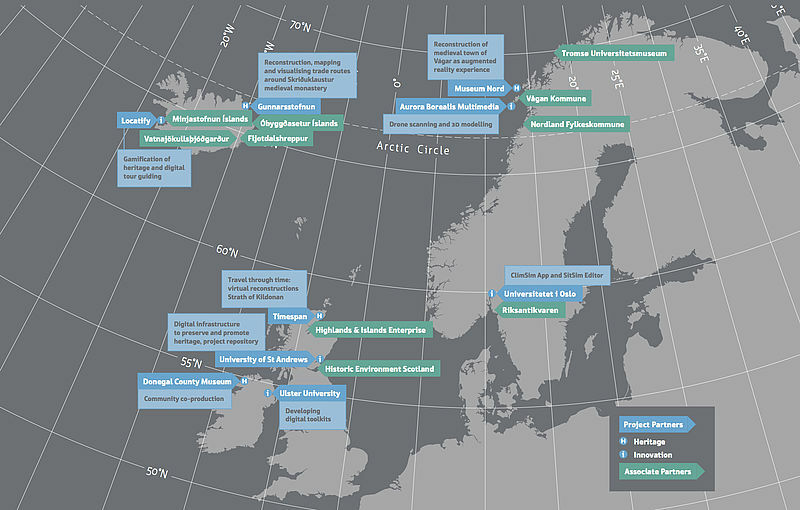 Connected Culture and Natural Heritage in a Northern Environment (CINE) is a collaborative digital heritage project between 9 partners and 10 associated partners from Norway, Iceland, Ireland, Northern Ireland and Scotland. CINE aims to transform people’s experiences of outdoor heritage sites through technology, building on the idea of “museums without walls”. New digital interfaces such as augmented reality, virtual world technology, and easy to use apps will bring the past alive, it will allow us to visualise the effects of the changing environment on heritage sites, and help us to imagine possible futures. For example, if you visit the SKREI Centre at Kabelvåg in Norway one day soon, you will see the medieval Vågar city, the first city in Northern Norway, appear before your eyes. Behind the scenes CINE will develop content management toolkits - enabling curators, archivists, historians, individuals and communities to make innovative heritage projects to create unique on-site and off-site customer experiences in specific locations. More broadly CINE will explore the social, economic and political role of heritage within our remote communities and develop best practice to shape relevant environmental policies. The project is funded by the Northern and Arctic Periphery Programme (ERDF). Anniversary Newsletter - CINE is one!